In elementary school, I was a bit of a teacher’s pet. Optional extra credit never felt optional to me, I raised my hand with the enthusiasm of a seven-year-old boy catching a fly ball, and had this Gooey Caramel Apple Cake been in my life back then, I would have ditched the classic apple and gifted my teachers with these wondrous squares of fall bliss instead. The fourth grade girl who relished finishing her mad-minute multiplication tables in fewer than 60 seconds and willingly chose the front row is still a part of me, but I like to think she’s better adjusted now. For example, she’s certainly realized that GPA isn’t nearly as important as she thought it was back then…but if you don’t mind, she’d love it if we could go ahead and declaratively award these Gooey Caramel Apple Cake an A+ anyway. Last week, I was debating which dessert to make for dinner at a friend’s, and though I’m smitten with this recipe for fresh apple cake, it just didn’t feel right. I craved something more decadent but not so rich that guests couldn’t finish their entire piece. My dream dinner party dessert would feel special and different, yet comforting and homey. I wanted to serve it warm with vanilla ice cream (because aren’t all of the best desserts served warm with vanilla ice cream? ), and most importantly, I wanted it to taste like fall. This Gooey Caramel Apple Cake fulfilled my every dessert wish. 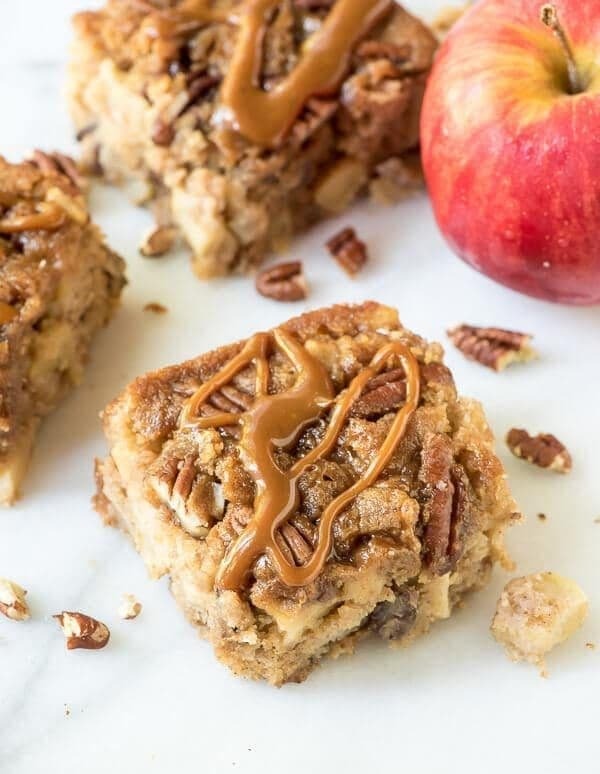 It’s unbelievably soft and tender, outrageously gooey and buttery, and every bite is spiced with sweet memories of apple picking, leaf jumping, and biting into a caramel apple large enough to make any dentist quiver. Gooey Caramel Apple Cake is the very best of fall, baked into a single pan. What makes this Gooey Caramel Apple Cake, well, gooey, is a generous pour of my homemade apple cider caramel sauce directly over the top of the batter before the cake bakes. In the oven, the caramel flavor seeps into every forkful, and it makes the resulting texture of the cake a cross between a super moist sponge cake and a classic gooey butter cake, with the taste of a caramel apple. Heaven. To add a little texture, I folded toasted chopped pecans into the batter, then arranged a few whole pecans over the top. I love the way their toasty crunch contrasts with the smooth caramel and moist cake. Finally, because pecans and fresh apples and all sorts of cinnamon and brown sugar and spice still didn’t feel sufficient to my inner overachiever, I went ahead and drizzled extra apple cider caramel sauce over the top of the cake too, because…do I really need a reason? *Quick recipe note* If you don’t have time to make the highly recommended apple cider caramel sauce, you can swap melted store bought caramels, though the apple cinnamon flavor in the resulting cake won’t be as intense. 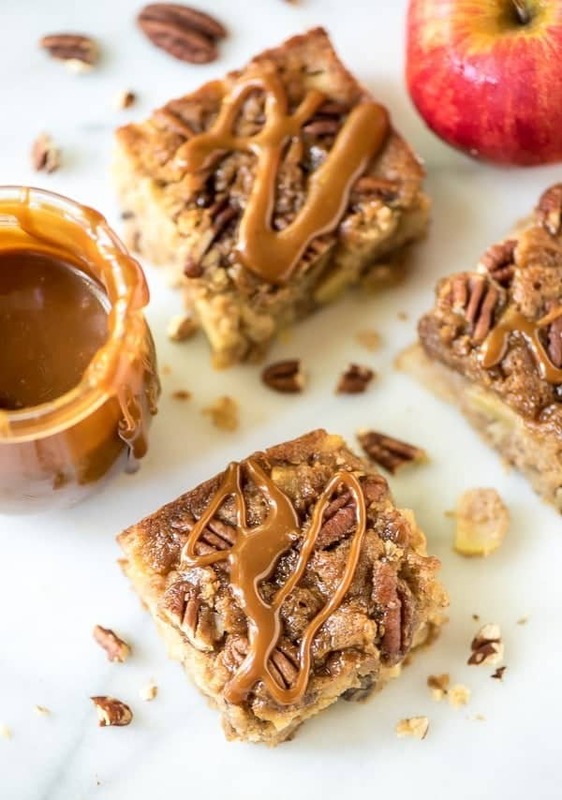 A moist and decadent caramel apple cake with cinnamon, pecans and an apple cider caramel sauce. Tastes like gooey butter cake combined with caramel apples! Preheat your oven to 350 degrees F. Lightly coat an 8x8-inch light metal baking pan with cooking spray, then with line parchment paper so that some overhangs the sides. Lightly coat a second time, then set aside. In a medium bowl, whisk together the white whole wheat flour, cinnamon, salt, baking powder, baking soda, nutmeg, and allspice. Set aside. In a large mixing bowl, beat the brown sugar, butter, coconut oil, egg, and milk on medium high speed until light and creamy, about 2 minutes total. Fold in the apples and 1/2 cup chopped pecans, reserving the whole pecans for the topping. Add the dry ingredients to the wet, then fold again until combined. Scrape the batter into the prepared baking dish. 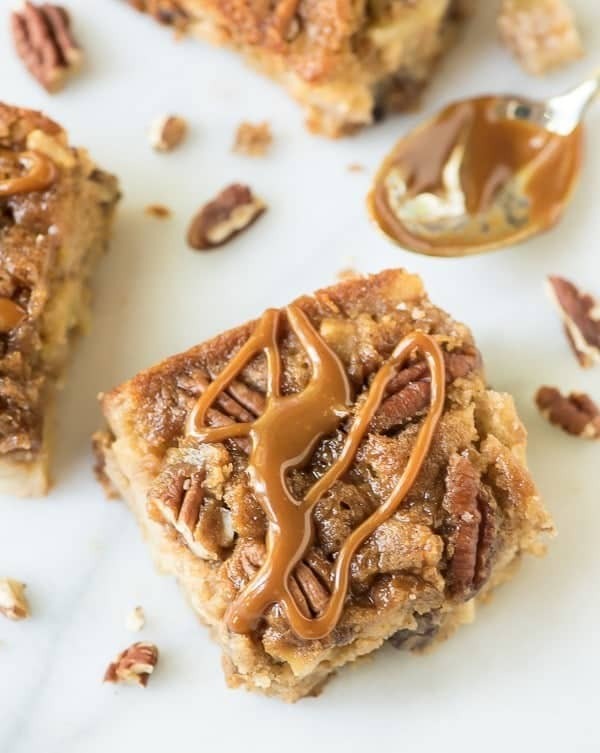 Drizzle the caramel over the blondies, then sprinkle with the remaining whole pecans. Bake until deep golden at the edges and the sides begin to pull away from the pan, about 30 minutes. Let cool in the pan on a wire rack for 30 minutes, then remove from the pan using the parchment paper “handles.” Cut into squares. Drizzle with additional caramel and top with vanilla ice cream as desired. *If you are in a hurry, you can also substitute about 25 melted store bought caramels for the 2/3 cup apple cider caramel sauce. If you’d like additional caramel for drizzling over the top, melt a few extra. I would not recommend jarred caramel sauce, as the consistency may be too thin to set properly. Um, YES 53,049,383 times!!! How could Autumn get better than this? This looks so great, I really feel like eating cake right now. I have like a million apples in my cellar and various neighbors keep distributing their apples around, I have never seen the apple trees quite as full as this year, so this is definitely on my to-do apple list. The title alone had me hightailing it over here! Gooey, caramel and apple are total trigger words for me right now! Ahhhh.. This cake is all I want in life right now. I’m sure you could have won over even the most curmudgeonly teacher with a piece of this deliciousness! This looks fantastic! Have you tried making it with all purpose gluten-free flour? If not, any thoughts on how it would turn out? Hi Kacie! No, I’ve never tried the bars this way, I’m afraid. I do hear great things about Bob’s Red Mill 1:1 Baking Flour Mix, which is gluten free and can be used to replace all purpose flour (you can find it on Amazon here: http://amzn.to/1M01eQC). If you decide to experiment with GF flour, I’d love to hear how the bars turn out! I just can’t speak from experience. Cake like this is what makes having sticky hands worth it! Love the caramel apple flavors going on here! Oh yummy this looks good! 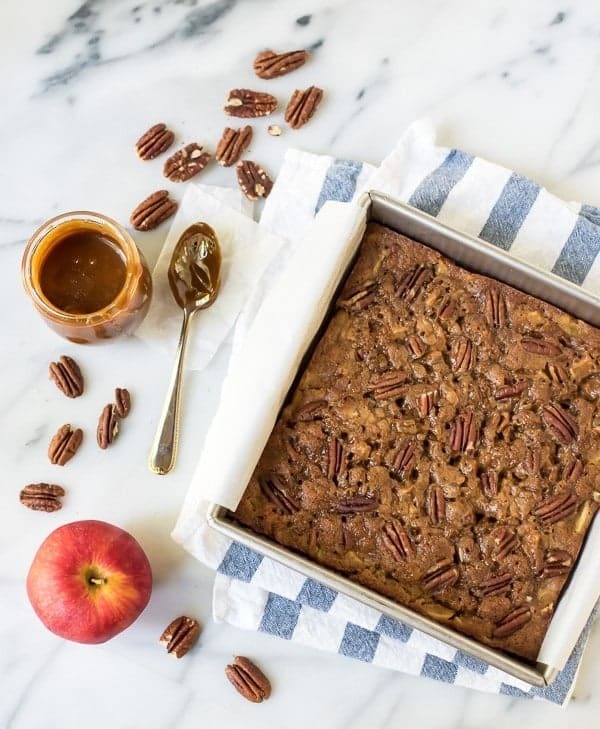 This Gooey Caramel Apple Cake looks worthy of an A+ to me! No extra credit needed here! Ummm excuse me while I wipe the drool off my keyboard. I can just smell these through my screen. They look gooey and chewy and amazing. WOW I seriously can’t wait to bit in to one of these suckers!! !